This badge was issued to Erika Varga on 03 Jan 2018. 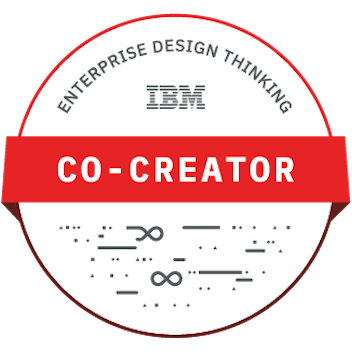 As a Co-Creator, the badge earner is an active contributor on Enterprise Design Thinking engagements. They help bring real-world user outcomes to life by growing collaboration skills and finding opportunities to step up and lead. Demonstrate the ability to knowledgeably discuss the benefits of Enterprise Design Thinking with colleagues. Show the integration of Enterprise Design Thinking into aspects of daily work. Share your own personal experience driving to outcomes with Enterprise Design Thinking. Satisfy all published standards of Enterprise Design Thinking Co-Creator. EARN: Complete the Enterprise Design Thinking Co-Creator Toolkit. You may also earn this through intimate in-person training and assessment. Contact IBM to learn more at designthinking@us.ibm.com.